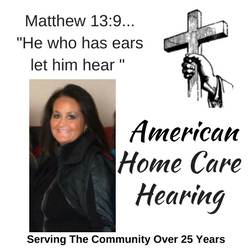 Deafness Separates Us From People"
Luckily, I was referred to Kelly, at American Home Care Hearing in Greenwood, Indiana. First, she did another hearing exam to verify the first exam and because of the way Meniere’s makes your hearing fluctuate. She explained she wanted a comparison to get the best fit for me on hearing aids. Thirteen years later, experiencing a 50% loss, Kelly is still personally taking care of my hearing problems and is just as dedicated as ever to helping people “hear” the sounds of their lives. The laughter that surrounds them, the tiny voices of their grandchildren, to be able to participate in conversations with their friends and family and so much more. There are other important matters where hearing is important. Such as understanding what the doctor is saying to you. When meeting with your lawyer. If you should fly, you must understand what to do if an emergency occurs. Other lives may depend on your actions and could be at risk if you should get something wrong. A good example, someone says,”Don’t shoot!” But all you heard was, “Shoot!” As you can see, you want to get it right. Kelly and her hearing aid business has been serving the Greenwood community for 25 years. Hearing exams are always free. Kelly, because of low overhead cost, can sell a set of aids much lower than her competitors. Well known names such as Starkey, Unitron and Resound to name some. Not only is she my hearing specialist, I worked for Kelly for almost 5 years as a hearing specialist. She personally trained me how to test, fit and program. Also, on how to extend the life of those aids because some people just can’t afford to replace them. I saw her continually go the extra mile for her clients to provide the best in service and in quality. Kelly also gives back to the community by donating her time at assisted living places by holding free hearing aid clinics for residents. Free cleaning, free exams and free consultations. If needed, repairs for a small fee. Kelly also sponsors activities for the residents. If you are ever in Greenwood, Indiana … stop by and say hello and while you are there, get a free hearing exam!